We had an early morning reservation for breakfast at Tusker House at Disney’s Animal Kingdom. It’s become quite the tradition now for us to have breakfast here, and then go on Kilimanjaro Safaris afterwards. What we didn’t know on this occasion, was that there was a Run Disney event going on, and so, when we arrived at the park, were directed to one of the further away parking lots. We then had to walk quite a distance to the entrance, because trams were not running this early in the morning. It wouldn’t have been so bad had I been fighting fit, but at this point in the holiday my back had just given up, and walking for long distances was not working out for me. We hired an ECV from the park entrance for me again, which made touring around Animal Kingdom a lot less painful for me. Without it I know we wouldn’t have got very far, and would have ended up cutting the day a bit short. 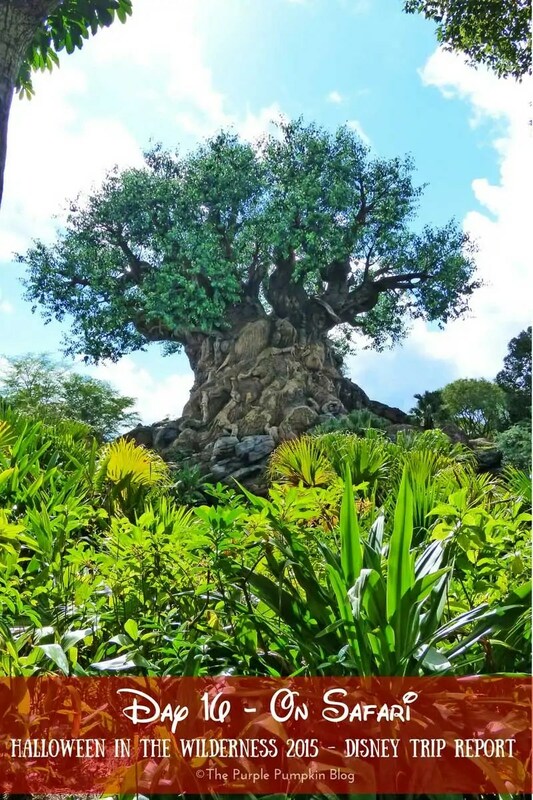 Once in the park, I took advantage of the lack of guests to take some clear photos of the Tree of Life, as well as other areas of the park on our way to Tusker House. We enjoy Tusker House because it’s a bit different from other breakfast buffet restaurants. Not only do they have regular breakfast foods, but also other dishes with an African influence. There is also the added bonus, that it is a character dining experience, so you also get to meet Donald Duck, Mickey Mouse, Goofy, and Daisy Duck, dressed up in their safari gear. You can help yourself to as much as you care to eat, and the characters walk around from table-to-table; meaning you will get a chance to meet each one for a photo opportunity and autograph. We have loved Tusker House since our very first time dining here. The inside of the restaurant itself is wonderfully themed, and the food is always great. It is a noisy restaurant though – character dining always is – so if you have members in your party with noise issues, be mindful of that. The seating is split into two areas. There is a smaller room, which is generally a bit quieter, and then a larger room. We’ve sat in both areas. The buffet is laid out between the two rooms, and is really spacious. The food is laid out in different stations, so you are able to come and go as you please, rather than having to do any formal lining up. I actually took photographs of the names of different dishes on offer, so will list them here, along with some photographs too. Whilst the menu can change at any time, these are the kinds of things you can expect to find on the buffet. Apple Turnover, Coffee Cake, Strawberry Turnover, Orange Bread, Blueberry Bread, Lemon Poppy Seed Bread, Chocolate Twists, Krispy Kreme Doughnut Holes, Croissants, Warm Cinnamon Rolls, Baked Banana Cream Cheese French Toast, Cheese Blintz, Cherry and Mixed Fruit Toppings, Assorted Breads and Bagels, Gluten Friendly Options: UDI’s Whole Grain Bread, Bagels, and Muffins; Kinnicknick Cinnamon Sugar Donuts, Namaste Mickey Waffles & 100% Maple Syrup (made upon request). As I said before, the characters walk around from table to table. You can see them moving around the room, so time your trip to the buffet accordingly! You may feel like the server is rushing you out the door when they hand you the check, but if you’ve not met all the characters yet, do not feel that you have to leave! Make sure you have your autograph book(s) and pen ready for those important signatures, and have your camera out too. The gang have lots of people to see, so don’t waste your time with them by hunting for these things when they’re at your table to meet you! Another fine breakfast at Tusker House for us! After having our fill, we paid the check (with our Dining Plan Credits) and made our way out into the hot sunshine. We had some time before our FastPass+ time slot at Kilimanjaro Safaris, so had a bit of wander around – which involved some time in the nearby shops! A huge Hidden Mickey in the stonework on the ground!